We’ve been emitting more carbon dioxide since the start of the Industrial Revolution, but temperatures go up and down from year to year. We have warm years and cold years, but over the long run, global temperatures have gone up. Carbon dioxide traps heat. We've known that since the 19th century. And as carbon pollution from dirty energy has gone up, the Earth's temperature has increased as well. Since 1880, the world has warmed nearly 1.5 degrees Fahrenheit (0.8 degrees Celsius) — and more than half the warming has occurred since 1979. But natural variations mean that the increase isn't steady from year to year. One year might be unusually cold, the next might be unusually warm. That’s why the lines on a temperature graph zigzag from year to year. When scientists filter out the “noise” from short-term variation, clear trends emerge. The global average temperature over the last hundred years has risen steadily along with carbon pollution. That carbon dioxide causes warming is well established by physics theory and decades of laboratory measurements. This is confirmed by satellite and surface measurements that observe an enhanced greenhouse effect at the wavelengths that carbon dioxide absorb energy. Given the strong causal link between CO2 and warming, what are we to make of periods where CO2 does not correlate with temperature (Figure 1)? The most commonly cited example is the recent years since 2002. Over this 7-year period, global temperature has shown little to no trend while CO2 has risen. 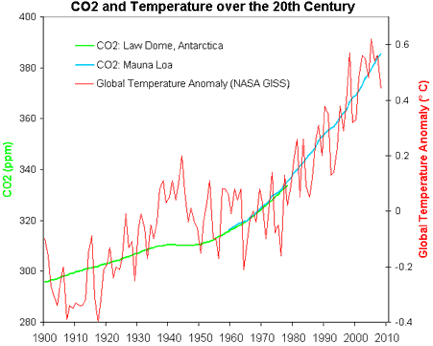 If CO2 causes warming, shouldn't temperature be rising steadily also? 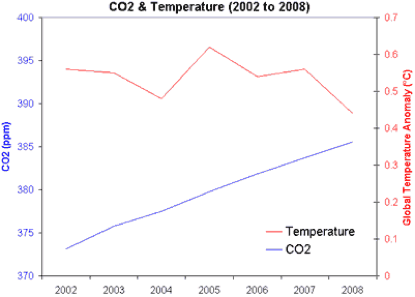 Figure 1: Annual atmospheric carbon dioxide (NOAA) and annual global temperature anomaly (NASA-GISS) from 2002 to 2008. © John Cook. However, this is a short period as far as climate trends are concerned. To understand recent years in the broader context of long-term climate trends, one needs to look at the temperature record over several decades. By comparing carbon dioxide levels to temperature from 1964 to 2008 (Figure 2), it becomes apparent that even during a long-term warming trend, there are short periods of cooling. 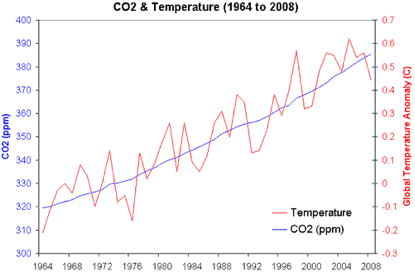 Figure 2: Annual atmospheric carbon dioxide (NOAA) and annual global temperature anomaly (NASA-GISS) from 1964 to 2008. © John Cook. Internal variability causes dramatic ups and downs in temperature compared to the more gradual long-term trend. Consequently, it's possible to select short periods throughout a long-term warming period where the warming slows or reverses. For example, the periods 1977 to 1985 and 1981 to 1989 both show little to no warming while CO2 continues to increase (Figure 3). Taken out of context, one might have concluded in 1985 or 1989 that global warming had stopped based on the previous few years of data. Figure 3: Annual atmospheric carbon dioxide (NOAA) and annual global temperature anomaly (NASA-GISS) from 1977 to 1985 and 1981 to 1989. © John Cook. What causes this climate variability? Ocean cycles shuffle heat around the climate system by exchanging heat between the ocean and atmosphere. This can have a strong short-term effect on global temperature, the most dominant cycle being the El Niño Southern Oscillation. In 2008, the Pacific Ocean was in a strong La Niña phase, leading to unusually cool temperatures throughout the tropical Pacific Ocean. Additionally, the sun was currently in solar minimum, experiencing the lowest solar levels in a century. Solar activity has an 11-year cycle which is estimated to have an effect of around 0.1°C on global temperatures. The combination of solar minimum and La Niña conditions would have a short-term cooling effect on global temperatures. This demonstrates the danger of drawing conclusions from one small piece of the puzzle without viewing the broader picture. If one focuses on just the last few years, one might erroneously conclude global warming has stopped. However, by looking at several decades of data, we see a climate that shows strong short-term variability. By understanding the mechanisms that cause climate variability, we see that the current cooling is short-term variation imposed on the long-term warming trend. What about a longer time series? Over the past century, are there any periods of long-term cooling and if so, what is the significance? Figure 4: Green line is carbon dioxide levels from ice cores obtained at Law Dome, East Antarctica (CDAIC). Blue line is carbon dioxide levels measured at Mauna Loa, Hawaii (NOAA). Red line is annual global temperature anomaly (NASA-GISS). © John Cook. Figure 4 compares CO2 to global temperatures over the past century. While CO2 is rising from 1940 to 1970, global temperatures show a cooling trend. This is a 30-year period, longer than can be explained by internal variability from ENSO and solar cycles. If CO2 causes warming, why isn't global temperature rising over this period? To answer this, one needs to recognize that CO2 is not the only driver of climate. There are a number of factors which affect the net energy flow into our climate. Stratospheric aerosols (e.g., from volcanic eruptions) reflect sunlight back into space, causing cooling. When solar activity increases, the amount of energy flowing into our climate increases. 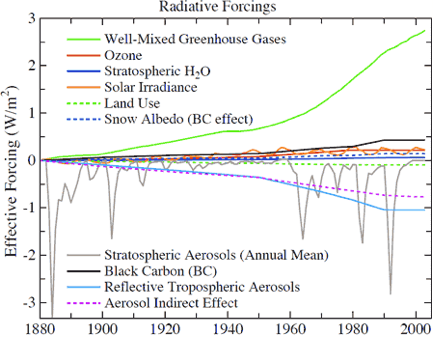 Figure 5 shows a composite of the various radiative forcings that affect climate. Figure 5: Separate global climate forcings relative to their 1880 values (NASA-GISS). Source: NASA/GISS. 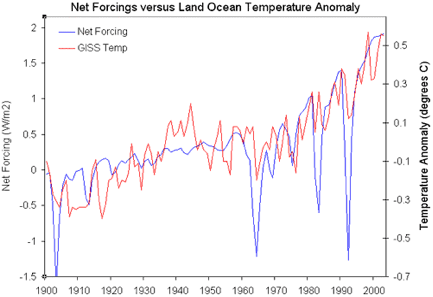 When all the forcings are combined in Figure 6, the net forcing shows good correlation to global temperature. There is still internal variability superimposed on the temperature record due to short-term cycles like ENSO. The main discrepancy is a decade centered around 1940. This is thought to be due to a warming bias introduced by U.S. ships measuring engine intake temperature. Figure 6: Blue line is net radiative forcing (NASA-GISS). Red line is global temperature anomaly (NASA-GISS). © John Cook. So we see that climate isn't controlled by a single factor — there are a number of influences that can change the planet's radiative balance. However, for the last 35 years, the dominant forcing has been CO2.